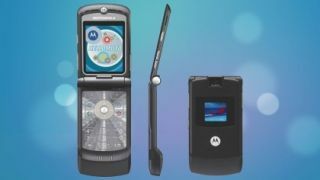 The Motorola Razr V3 flip-phone is one of the best-loved phones from the past, and according to a new patent it could be making a striking return with a foldable screen. A patent application at the US Patent Office spotted by Dutch site Mobielkopen appears to suggest that Motorola is, at the very least, considering a flip phone that features a large, foldable screen inside the clamshell design. The handset detailed in the patent appears to have a significant hinge in its middle, and when it's closed, the way the screen folds appears to leave a gap between each side of the clamshell - which is just asking to collect all manner of dirt and dust when in your pocket or bag. Motorola actually applied for the patent back in May 2017, but it has only just come to light and the application is by no means a guarantee a handset like this will ever make it to market - but don't lose hope just yet. TechRadar exclusively reported earlier this year that Motorola's CEO hinted that the firm may reboot its iconic Razr V3 model - no doubt boosted by the reception the new Nokia 3310 and Nokia 8810 4G received. The idea of a new Razr V3 is already in the minds of the folks at Motorola then, and this latest patent leak adds further fuel to the fire that it may give us a blast of nostalgia sometime in the future.